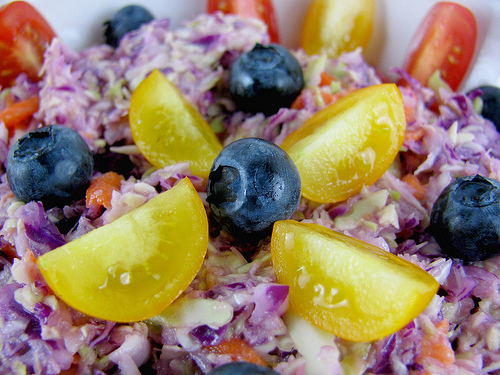 Would you ever have thought of putting blueberries in coleslaw? I’m not sure I would have, just like I wouldn’t have thought of a blueberry corn salad until I saw it at Foodportunity and now HAVE to make it. Even before I went to Canterberry Farms, I checked out their website and noticed several recipes using their blueberry vinegar. When I ended up buying the vinegar, I decided the first thing I would make was the coleslaw since I had half a red and half a green cabbage left from our CSA. The tarts I made mainly because I had 8 mini tart pans I got for $1.50 at a garage sale and was dying to use them. In case you haven’t noticed, I LOVE colorful food. Food should be fun and bright colors just grab my attention and scream FUN! That’s a great thing about this cole slaw, with two different colors of cabbage, two different colors of tomatoes, and carrots and blueberries, it’s bursting with both color and flavor. You want to make this salad now, while tomatoes are in season because these cherry tomatoes are so sweet they’re like candy! I definitely made some changes from the farm’s original recipe. I’m not real big on mayonaisse so never use as much as most recipes call for. 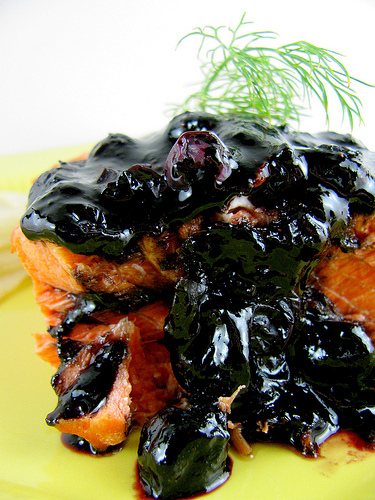 If you don’t have blueberry vinegar, sub with your favorite. I bet raspberry, or even apple cider vinegar would be great. Grate cabbage into a bowl. Mix in onions and carrots. In a small bowl mix mayonnaise, vinegar, and mustard until smooth. Stir into cabbage mixture and refrigerate for 15-30 minutes. Add salt and pepper to taste. Garnish with blueberries and cherry tomatoes cut into quarter wedges. Approximate cost/serving: This is so cheap! You can often even buy halves of cabbages at the grocery store if you don’t have a CSA or farmer’s market to get them at. The whole dish cost us $2.50 to make and was enough for more than 6 people as a side dish, but we’ll call it 42 cents a serving. Vegetarian/Gluten Free: This is both, if you want to make it vegan, use vegan mayo. For the tart I really wasn’t sure what I was doing but for some reason decided not to use a recipe. I had some leftover shortcrust pastry that I used for the crust, you could use a graham cracker crust, or a frozen crust, or your favorite pie crust. Just press it into the tins and bake it until golden. The recipe here is for the filling I made up, which was a big hit when I brought it to our Bible study. Mix cream cheese, sour cream, sugar, and vanilla in a bowl. Once crusts have cooled slightly, pour filling into crusts. 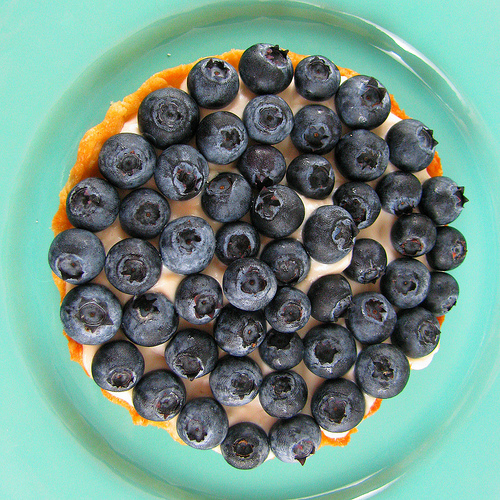 Neatly arrange blueberries on top of filling. Refrigerate at least 30 minutes to set. 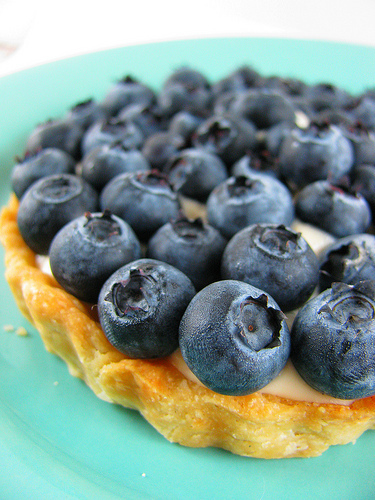 Cut each tart into halves or quarters to serve. Approximate cost/serving: This is hard to estimate because it depends on what crust you use. Because I had some frozen leftover crust dough, and really cheap fresh berries, it only cost me 50 cents in filling ingredients and berries for both. Vegetarian/Gluten Free: Totally meatless, for gluten free you MUST use a gluten free crust or crust recipe. I love the tarts!!!! I can just taste it. 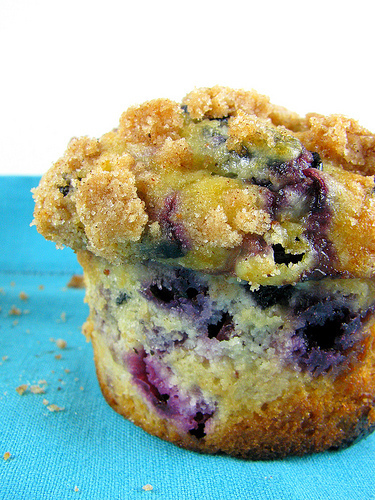 Mmmmm… I’ve also never had blueberry in a slaw. That’s pretty new to me. I’ve got the try that. I love the idea of using them in a coleslaw very colourful indeed. I must say that your food does indeed scream FUN! 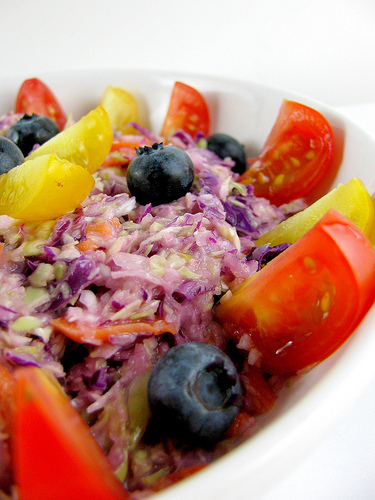 This coleslaw sounds quite intriguing and it looks delicious! The tarts are simply yum! The tart tasted great! Not too sweet. Normally I am not a huge fan of blueberries but I liked it.